"How to Discover and Turn Your Passion into Profit Online!" "Discover a Simple, Step-by-Step Method to Turn Your Passion into Profit Online...Revealed by a Once Broke Store Clerk Who Earned Over a MILLION Dollars in Sales Online!" You will get the essential golden nuggets in this short & to the point video course (approximately 1 hour). If you want to discover your passion and turn your passion into profit online, then watch this video all the way and read this quick letter. You're about to discover how you can INSTANTLY find out what your UTLIMATE passion is AND make money online from it! 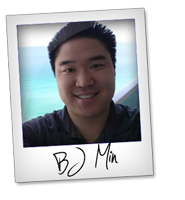 My name is BJ Min and I am the bestselling author of the book "How to Make Money with Ebooks" and a regular guy who went from being broke to earning a six figure income for multiple years in a row. In fact, I used to struggle online. My dream and passion was to make money online but I never succeeded in that dream. I even gave up on my dreams! But I got so sick and tired of working at my deadend job at the convenience store that I went for my passion and my dreams again. And I learned how to profit from literally anything that I had a passion, expertise, or knowledge in whether it was about topics related to music, quitting addiction, making money online, or whatever I had some kind of interest in. In fact, I did it so well that I ended up earning over a MILLION DOLLARS in sales in my digital and high profit business all on the internet. Now, I want to SHARE my real life lessons of turning your passion into profit online and it doesn't even matter if you don't know what your passion is right now because I will SHOW you how ANYONE can discover their passion with some SIMPLE 5-second questions! That's why I decided to create a simple and short online video course to help you discover your passion and turn your passion into profit online called "Passion to Profit Online 101" course! A simple way to discover your passion with just one single question! How to monetize your passion on the internet without having your own product! How to make money online with your passion WITHOUT having to build a site, build a sales page, or build a product! Profit from your passion by creating and selling digital products that don't need any inventory! How to build a loyal group of followers who will buy from you over and over again because your passion fires up their passion as well! A simple 10-step blueprint to discover your passion and turn your passion into profit online WITHOUT even having to talk to anyone because it's all online! Real life lessons from a real guy like myself who went from being broke to earning a six figure income online achieving my dreams of making money online from my passions and hobbies! Click the link below to discover your ultimate passion and start turning your passion into profit online now! Click Link Below to Get "Passion to Profit 101" to Discover Your Passion and Turn It Into Profit Online!"